I love fires. I love the smell of burning leaves and the smoky smell that gets on you when sitting around one. I especially love hanging out with friends around one, making s’mores and chatting. So I decided that I wanted a firepit in my yard. And since I am me, I couldn’t just go buy one in the store. So I scoured the internet and found this beauty, which I had every intention of building (almost) per the instructions. But no matter where I looked, I could not find tree rings! So the project went on hold until this summer, when I started looking for other inexpensive fire pit ideas. 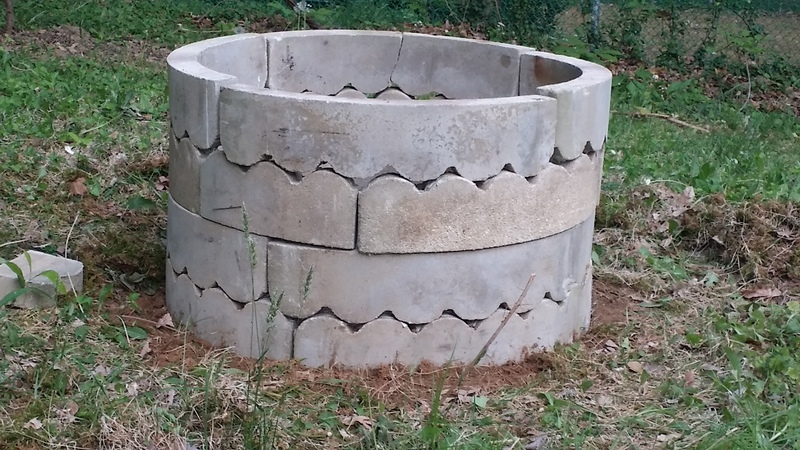 I posted on Freecycle, looking for free bricks to build a more traditional firepit with. I also added a line asking for curved, scalloped bricks but not expecting anyone to have them. Lo and behold, someone did! He had about 100 of these beauties in the back of his property, and I was free to take as many as I needed. 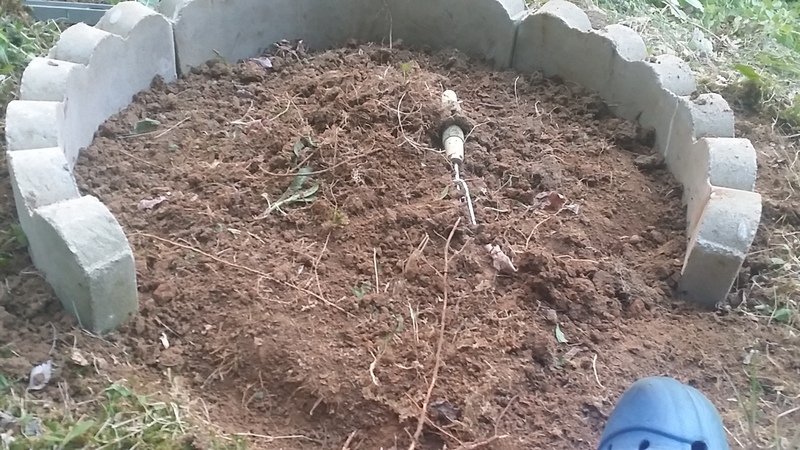 So the next free weekend I had, I went to work, leveling the ground and figuring out where I should put it. Baltimore County code only says firepits need to be 15 feet away from any buildings and clear of overhanging branches. So I figured out how far away that was and started digging. I put the first circle down and then built a trench about 4″ deep for the bricks. I got out my level and made sure they were even. Unlike the original post I was vaguely basing this off of, I did not want to use a grill or a BBQ as a base. I wanted to throw the combustibles right into the pit. This required a little bit of research, but I found out you can do just that safely by adding stones and sand on top of soil. So that I did. I grabbed two 0.5 cu. ft. bags of decorative stone and one 0.5 cu. ft. bag of paver base sand and filled it up, stones first. In retrospect, I probably would have used two of each. The reason why I wanted to use the scalloped bricks had to do with airflow. The more airflow, the more oxygen the fire gets and the longer it burns. When the bricks are stacked right, spaces are left between the scallops. This was also the reason I did not use mortar to put the firepit together. Instead, I used masonry caulk so I did not have to worry about filling any of the holes in with concrete by mistake. Make sure to use masonry caulk that is rated for high temperatures! The tricky thing about using the caulk was making sure to put the caulk where the bricks naturally fit together. I started out putting it on the tops of each scallop, but when I put the next brick on top, it didn’t touch it at all. I purchased one tube of it, but had to stretch it out to finish the project. I would suggest two tubes in hindsight. I stacked the bricks right side up for the first layer and upside down for the next, building four layers in total. I made sure the bricks were level on each layer before putting the next. I also lined the bricks up differently on each layer, which is supposed to make it stronger. Also, I liked the way it looked. Voila! Un foyer pour Le Canard! The fire pit sits on top of a ridge in my yard. It looks kind of plain, but it works well. I had friends over on Friday for the inaugural lighting. After a few attempts (my kindling was not dry enough) and the use of a Yellow Pages, we got the fire going. We dragged my patio benches up around the pit and lit some tiki torches and roasted marshmallows for s’mores. Two of us drank beer, the other cherry cider because she is expecting. It was a good night. Friends, food, and fire. What a great combination.